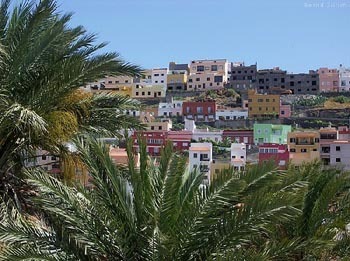 Discover how it is and what to see in La Gomera and be surprised by its most interesting sites. La Gomera is one of the smallest island on this archipelago, yet offers many interesting sites as woods, shine cliffs, picturesque towns that still conserve their most ancient traditions alive. Description: One of the best national parks in Spain. It houses one of the most emblematic laurel woods in the Canary Islands and it has been classified World Heritage by UNESCO. Description: This is the widest municipality on this island with many interesting spots. Description: This basaltic formation might be found in La Gomera. It’s an impressive cliff that rises from the sea till 700 meters high. Description: One of the best national parks in Spain. Has one of the most emblematic laurel forests in the Canary Islands and it has been classified UNESCO World Heritage. Description: From this viewpoint you’ll enjoy one of the most impressive views over the valley. Description: Precious beach with dark volcanic sand. Address: San Sebastián de La Gomera. Description: Capital of the island, a town of many traditions and culture. Its city centre has more than 500 years of history. Description: It has many native and protected species as well as impressive cliffs. Description: Composed by three rocks: Roque Agando, Roque Ojila y Roque La Zarzita. Address: C/Ruiz Padrón 19, San Sebastián de La Gomera. Description: This is an old fortress from 1450 in which interior you might see a mapping exhibition. Description: Small yet beautiful beach.